Coronary artery bypass graft surgery is performed to remove blockages that obstruct the blood flow. The surgery provides bypass for blood flow by grafting vein or blood vessel from the thigh. Depending upon the number of blocks either a single or multiple grafts are used. CABG is surgery is performed to improve the quality of life and reduce symptoms of angina and other cardiovascular disorders. The global coronary artery bypass graft market was valued at US$ 104.0 Mn in 2017 and is anticipated to reach nearly US$ 163.9 Mn by 2026, expanding at a CAGR of around 5.3% from 2018 to 2026. Increase in incidence of cardiovascular diseases due to stress, obesity, sedentary lifestyle, and unhealthy habits are factor are likely to fuel the global coronary artery bypass graft market from 2018 to 2026. Increase in adoption of endoscopic surgeries, surge in incidence of cardiovascular diseases, demographic changes, rise in complications such as obesity and stress due to sedentary lifestyle and aging population, and growth in medical tourism drive the global coronary artery bypass graft market. However, lack of regulatory approvals, rise in cardiac complications after CABG, and high cost of surgery are major factors restraining the global coronary artery bypass graft market. The global coronary artery bypass graft market is segmented into product type, device type, technique type, end-user, and geography. In terms of product type the global coronary artery bypass graft market is segmented into on-pump CABG, off-pump CABG, minimally invasive direct CABG, and conventional CABG. Based on device type, the global coronary artery bypass graft market is divided into tissue stabilizers, heart positioner, refractors, cannulas, cardiopulmonary bypass machine, endoscopic vessel harvesting systems, and others. In terms of technique type, the global coronary artery bypass graft market is bifurcated into traditional vessel harvesting and endoscopic vessel harvesting. Based on end-users the global coronary artery bypass graft market is further segmented into hospitals, cardiology clinics, and research and academic institutions. In terms of geography, the global artery coronary bypass graft market is classified into North America, Europe, Asia Pacific, and Rest of the World (ROW). Based on product type, the off-pump CABG segment dominates the global coronary artery bypass graft market. Expansion of this segment is attributed by its advantages such as reduced inflammatory response, lower post-operative complications, minimal blood loss, lower morbidity, and mortality rate. These factors increase demand for off-pump CABG procedures. Off-pump CABG procedures are extensively used for multiple grafts. The on–pump CABG is the second largest segment boosting the global coronary artery bypass graft market. It is extensively used for single artery graft procedures. In terms of device type, the tissue stabilizers dominated the global coronary artery bypass graft market in 2017 and is estimated to continue to dominate the market during the forecast period. Heart stabilizers is the second largest segment propelling the global coronary artery bypass graft market in terms of revenue. Both these segments together accounted for market share of approximately 50% in 2017. Heart stabilizers are widely used to immobilize the heart. Tissue stabilizers and heart positioners are employed in off-pump CABG procedures. The endoscopic vessel harvesting system segment is projected to boost the global coronary artery bypass graft market in terms of revenue during the forecast period. Based on technique type, the endoscopic vessel harvesting segment dominates the global coronary artery bypass graft market. Endoscopic vessel harvesting system are used for CABG procedures. Advantages such as small incision, minimal blood loss, reduced hospital stay, less risk of infection are a few factors that drive the segment. The low cost comparison between traditional vessel harvesting system with endoscopic drives the growth of global coronary artery bypass graft market. In terms of end-user, the global coronary artery bypass graft market is segmented into hospitals, cardiology clinics, and research and academic institutes. The hospital segment dominates the global coronary artery graft market. According to the American Hospital Association, in the U.S. there are 5,534 registered hospitals. Increase in number of hospitals, improvements in reimbursement policies, and increase in incidences of cardiovascular diseases are expected to drive the global coronary artery bypass graft market. The cardiology clinics segment is likely to create opportunities in Asia Pacific. Based on geography, the global coronary artery bypass graft is segmented into North America, Europe, Asia Pacific, and Rest of the World (ROW). North America and Europe together accounted for approximately 60% share of the market in 2017. Improved health care infrastructure and rise in awareness regarding cardiovascular diseases and its treatment drive the market in Europe and North America. Increase in medical tourism in India is projected to drive the coronary artery bypass graft market in India. Technological advancements and availability of medical devices in Japan and China are expected to drive the market in these countries. The countries of rest of the world have a great potential for coronary artery bypass grafts market due to increasing incidence of cardiovascular diseases and also due to advancement in the technology. Major players operating in the global coronary artery bypass graft market are Medtronic, TERUMO CORPORATION, KARL STORZ GmbH & Co. KG, Boston Scientific, Ethicon (a subsidiary of Johnson & Johnson), Neograft, Sorin Group, MAQUET Holding B.V. & Co.KG, Edwards Lifesciences, Vitalitec International, Inc., Novadaq Technologies Inc., and Genesee Biomedical Inc. These players adopt organic and in-organic growth strategies to expand product offerings, strengthen geographical reach, increase customer base, and capture market share. This report analyzes the current and future scenario of the global coronary artery bypass graft market. 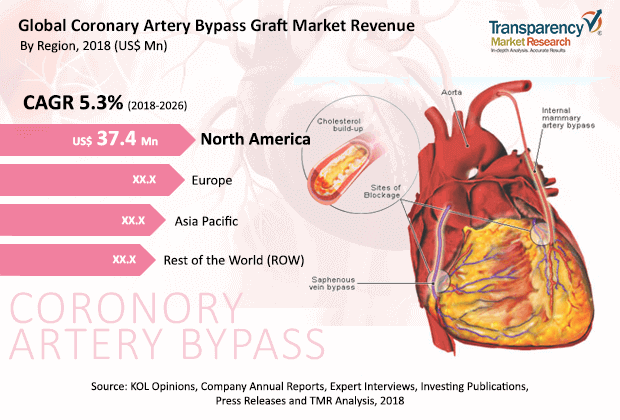 Increase in incidence of cardiovascular diseases, rise in adoption of endoscopic surgeries, favorable reimbursement policies, surge in medical tourism, and technological advancements are factors expected to drive the global coronary artery bypass graft market during the forecast period. The global market has been segmented based on product type, device type, technique, end-user, and region. The global coronary artery bypass graft market report comprises an elaborate executive summary, which includes a snapshot that provides information about various segments of the market. It also provides information and data analysis of the global market with respect to the segments based on product type, device type, technique, end-user, and region. A detailed qualitative analysis of drivers and restraints of the market and opportunities has been provided in the overview section. Additionally, the section comprises competitive matrix and company profiles along with business overview to understand the competitive landscape in the market. This section of the report also provides market attractiveness analysis by region and market share analysis by key players, thereby presenting a thorough analysis of the overall competitive scenario in the global coronary artery bypass graft market. Based on product type, the global coronary artery bypass graft market has been segmented into on-pump CABG, off-pump CABG, minimally invasive direct CABG, and conventional CABG. The market size and forecast for each of these segments have been provided for the period from 2016 to 2026, along with their respective CAGRs for the forecast period from 2018 to 2026, considering 2017 as the base year. In terms of device type, the global coronary artery bypass graft market has been classified into tissue stabilizers, heart positioners, refractors, cannulas, cardiopulmonary bypass machines, endoscopic vessel harvesting systems, and others. The market size and forecast for each of these segments have been provided for the period from 2016 to 2026, along with their respective CAGRs for the forecast period from 2018 to 2026, considering 2017 as the base year. Based on technique, the global coronary artery bypass graft market has been bifurcated into traditional vessel harvesting and endoscopic vessel harvesting. The market size and forecast for each of these segments have been provided for the period from 2016 to 2026, along with their respective CAGRs for the forecast period from 2018 to 2026, considering 2017 as the base year. In terms of end-user, the global coronary artery bypass graft market has been divided into hospitals, cardiology clinics, and research & academic institutions. The segments have been analyzed based on health care infrastructure, government investment, and economic development in the regions. The market size and forecast for each of these segments have been provided for the period from 2016 to 2026, along with their respective CAGRs for the forecast period from 2018 to 2026, considering 2017 as the base year. Geographically, the global coronary artery bypass graft market has been categorized into four major regions and the key countries in the respective region: North America (the U.S. and Canada), Europe (the U.K., Germany, France, Spain, Italy, and Rest of Europe), Asia Pacific (India, China, Japan, and Rest of Asia Pacific), and Rest of the World (RoW). The market size and forecast for each of these regions and the mentioned countries have been provided for the period from 2016 to 2026, along with their respective CAGRs for the forecast period from 2018 to 2026, considering 2017 as the base year. The research study also covers the competitive scenario in these regions. The report also profiles the major players in the market in terms of various attributes such as company overview, financial overview, product portfolio, business strategies, and recent developments. Major players operating in the global coronary artery bypass graft market are Medtronic, Terumo Corporation, KARL STORZ GmbH & Co. KG, Boston Scientific, Ethicon (a subsidiary of Johnson & Johnson), Neograft, Sorin Group, MAQUET Holding B.V. & Co.KG, Edwards Lifesciences, Vitalitec International, Inc., Novadaq Technologies Inc., and Genesee Biomedical, Inc. These players are adopting organic and in-organic growth strategies to expand product offerings, strengthen geographical reach, increase customer base, and garner market share.